CLEANING THE WORLD IN ONE DAY – PARTNERSHIP IN ACTION! You are here: Home / Environment / CLEANING THE WORLD IN ONE DAY – PARTNERSHIP IN ACTION! It is estimated that each year, 8 million tonnes of litter end up in the environment – causing a serious threat to people, wildlife, soil, water and air. The World Cleanup Day is a call to action for the public, decision makers and all citizens alike, to take real action in solving the waste problem. For the past 22 years, Plastics|SA has been partnering with Ocean Conservancy by coordinating South Africa’s involvement in the annual International Coastal Cleanup Day. This annual event takes place on the third Saturday in September and sees thousands of volunteers each year collecting and removing litter from our waterways as part of Cleanup & Recycle SA week. This year, the week will take place from 10-15 September 2018 – culminating in the first World Cleanup Day on Saturday, 15 September 2018. “This is the biggest positive civic action the world has seen, and we are fortunate to be part of this global movement that hopes to inspire change in human behaviour,” says Douw Steyn, Sustainability Director of Plastics|SA. Packaging waste continues to be one of the biggest culprits when it comes to pollution of our water sources and marine environment. However, as one of the first signatories of the Marine Debris Declaration, whereby 74 plastics associations from around the world have committed themselves to fight marine litter in 2011, Plastics|SA actively supports projects in six key areas aimed at contributing to sustainable solutions, namely education, research, public policy, sharing best practices, plastics recycling/recovery, and plastic pellet containment. “We have managed to get other packaging streams and retailers to support our efforts and recycling initiatives, such as our beach clean-ups, Operation Clean Sweep, sponsoring litter booms and the Aqua Amazing schools’ education programme. Last year alone, we donated 350 000 yellow refuse bags that were used for clean-ups around the country and assisted coordinators with audited clean-ups,” he says. Approximately 80% of ocean litter is derived from land based waste. Without effective waste collection, an avalanche of debris will enter the ocean. To prevent this, Plastics|SA is not only encouraging South Africans of all ages, races and backgrounds to participate in this year’s Cleanup and Recycle SA week activities and World Cleanup Day, but also to be responsible in their daily activities by ensuring their recyclables are collected for recycling as we all continue to work towards a common goal: creating a cleaner world. 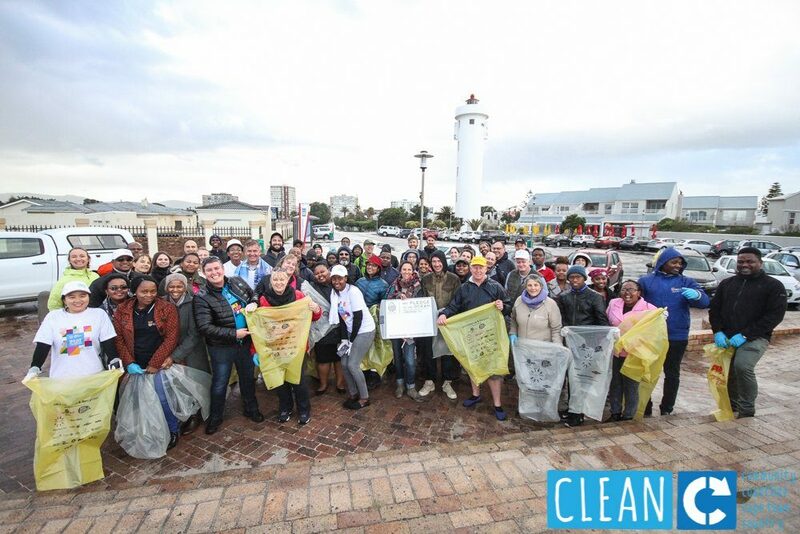 South Africa’s participation in the World Cleanup Day was launched at a beach cleanup that took place at Milnerton’s Woodbridge Island in Cape Town last week. Attending the event was Erik Solheim, United Nations Environment Executive Director, who joined Clean C, the Department of Environmental Affairs, Let’s Do It Africa team, Plastics|SA and other organisations. Solheim said it was very encouraging to see the enthusiasm and the efforts by locals to protect the ocean and keep the beaches clean. “South Africa is doing great and it is fantastic to see so many people being mobilized. Your country has some of the most beautiful beaches in the world and has a very long coastline. However, more needs to be done. We see the problem of litter on the beaches and marine environment all over the world. The good news is humans created this problem, but we can definitely solve it too. We need to clean the beaches and keep them beautiful, but we also need to stop the garbage coming from the source,” Solheim encouraged.